3. See that the vehicle is unloaded (except for full levels of coolant, engine oil and fuel, and spare tire, jack, and tools). Have the driver or equivalent weight in driver’s seat. 4. Clean the head light lens and turn on the headlight (Low beam). 6. 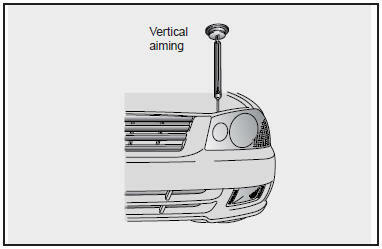 Draw the vertical line (through the center of each headlight) and the horizontal line (through the center of each headlight) on the aiming screen. And then, draw the parallel line at 1.18 in (30 mm) place under the horizontal line. 7. Adjust each cut-off line of the low beam to the parallel line with a Phillips screwdriver VERTICAL AIMING.